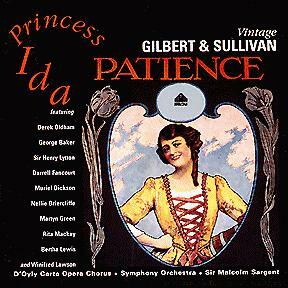 This recording, coming towards the end of the electrical era, was D'Oyly Carte's second Ida. The earlier set is more historically important, for its proximity to the opera's first London revival and its inclusion of "Come, mighty must," which D'Oyly Carte stopped performing after Bertha Lewis's death. This recording, however, benefits from the more-advanced electrical technology. The cast give an extremely "live" performance that easily surpasses either of D'Oyly Carte's subsequent recordings. In an earlier version of this page, I reported that the Happy Days re-issue makes two small cuts in "Whom thou has chained," but Marc Lewis pointed out that all versions have this cut. He also observed that the 1924 set makes a larger, but different, cut and includes the women whereas this set records Oldham as a solo. This was the last complete opera recorded during Henry Lytton's tenure as Principal Comedian, and one of the few he ever recorded. 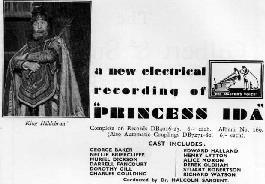 Most of the other operas recorded in this period featured George Baker in the patter roles. According to Micheal Walters, "the official reason given was that Lytton had started to suffer from lip paralysis, and his diction was not as clear as Baker's." Walters says you can hear the deterioration very slightly on this recording, but not on Lytton's earlier ones. Chris Webster's CD re-issue is from original masters sourced at EMI's Abbey Road Studios. Well, how can I put this? There are many people who think this is the finest recording ever made of this opera, but I cannot list myself as being one of their number. OK, as it's fairly obvious that as I don't like Dickson in G&S, I'm not going to care for her as Ida, but there are other performances here which I just don't think are worthy of any accolades. Oldham is just too Oldham-like for words, and he slides all over the place in a manner that some find dreamy and suitably sentimental, but which I find horrible, Baker has no personality as Florian, and Goulding as Cyril just doesn't come across on record at all. This is quite strange because I've read some wonderful reviews of his performances, but neither here nor on his only other G&S recording (the 1930 Pinafore) does he sound comfortable with what he is singing, and I don't think there is the slightest hint on record of what I believe he could achieve in the theatre. There are however several redeeming features in the cast, sadly only in minor roles, but they ARE there and their contributions ARE a real pleasure and DO make a difference. I am speaking of Henry Lytton, who in spite of some diction problems still gives us a lovely characterisation as Gama; Darrell Fancourt, who gives a very fine rendering of "This helmet"; Nellie Briercliffe who gets the most out of every syllable as Melissa (except one — I do wish she had gone up on "exCLAIM"); and Richard Watson (sounding almost unrecognisable to my ears to the RW voice of the 1950 recordings), who is a very strong, no nonsense Hildebrand. These contributors do help somewhat to balance things up, but I do think that it is Sargent and his chorus who really save the day with the energy that they inject into what would otherwise be an even patchier recording than I think it is. So swift is it in places that we are never allowed to mull over a problematic moment for too long. I'm sure that, despite my comments, taken as a whole most people will enjoy this set. 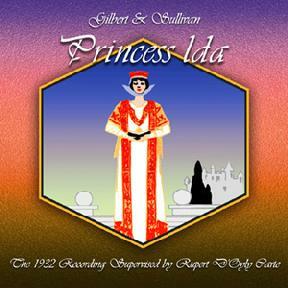 There are a number of major G&S folk who put this right at the top of their list of Ida recordings, and I dare say that I am in the minority with my feelings. It is impossible to compare this recording with that of any other company, for the Gramophone Company enjoy the privilege of using the scores and parts of the D'Oyly Carte Opera Company, or, where necessary, making their own orchestral arrangements. Other recording companies are not permitted to do this, and are, therefore, restricted in their recording of Gilbert and Sullivan's works to the narrow limits of the published orchestral selections. Here, then, is something that you can get on no other record — nor should you waste time in search were it possible to do so — for the Gramophone Company are to be congratulated on the high standard that they reached in this, their latest achievement. The only fault to be found with the recording is that it is a little too full, or, shall we say, it occasionally sacrifices quality for quantity. Apart from this, it is excellent — always sharp, clean, and well defined, with little or no surface noise. Equally good is the orchestra, under the experienced baton of Dr. Malcolm Sargent. Their finished playing leaves nothing to be desired, unless we ask, perhaps (in one or two places), for what we so seldom get in this country — an orchestral accompaniment, instead of a fight to the death between soloists, chorus and orchestra. I wish it were possible to speak as highly of the singing, for, while the chorus direction is really fine and their singing good (diction, as usual in chorus work — poor), the soloists are below the standard set by the recording and orchestral work. Of the gentlemen, Richard Watson (King Hildebrand) and George Baker (Florian) are by far the best. The honours among the ladies are shared by Muriel Dickson (Princess Ida) and AIice Moxon (Lady Psyche). I understand, by the way, that Miss Moxon was called in at the last minute to deputise, and, if this is so, her performance is all the more praiseworthy. The remainder of the cast (with one notable exception), despite the fact that some of them are now playing in Gilbert and Sullivan opera at the Savoy Theatre, are, frankly, disappointing. Might I add that this is another argument in favour of casting works for recording from experienced gramophone recording artistes? The one exception is, of course, Sir Henry Lytton; I cannot imagine that George Grossmith, the original King Gama, could be more amusing, or have made better records of his part than those of this famous Savoyard. Incidentally, Sir Henry's diction is better than most of the singers in this series. And now — having said all this — I shall still count this album one of the gems of my collection. 1996 Happy Days CD 75605 52273 2 With 1930 Patience. The table above shows the published takes in the order recorded. Where a session produced both unpublished and published takes for the same selection, the unpublished matrix numbers are shown in italics. Where none of a selection's takes from a given session were published, the entire row is shown in italics, and the side number is blank. Where it is not possible to make a likely guess about the number of takes recorded at a session, this is indicated with “…” Where the published take was achieved without a make-up session being required, the unpublished takes for the same selection are not shown. This recording marked the first time that one of the Gramophone Company's G&S sets was recorded in such a concentrated period—four consecutive days in late September 1932, with a make-up session in October for three sides that the first group of sessions failed to record acceptably. Perhaps the short time-frame contributed to the artistic excellence that many critics have found in this recording. The make-up session on 27 October is curious. It involved three sides that had been recorded consecutively one month earlier to the day, on 27 September. It is possible that Francis, who supplied these dates, was off by one month. This would mean that the entire recording was completed on 26–29 September, with no make-up sessions. However, it was atypical for a side to be attempted more than two or three times on the same day. The published s. 18 went to four takes, and the published s. 11 went to five takes. I am therefore inclined to believe Francis.